> New extravascular device for occlusion of the femoral arterial access site. 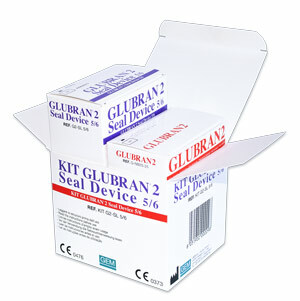 The Kit is made up of Glubran 2 glue and its applicator “Glubran 2 Seal Device”. “Glubran 2” glue is used to occlude arterial access sites in an unique and revolutionarymethod, absolutely innovative with regard to those used up to today. The procedure is simple, quick and extremely safe for its control in releasing under scopy. “Glubran 2 Seal Device” is the applicator specially studied to be hooked and made slipping along the outer surface of the introducer sheath , to go easily through the subcutaneous adipose tissue and to stop itself into the point where the glue is released. 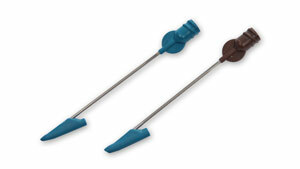 The applicator is in 5-6 French and 7-8 French sizes.